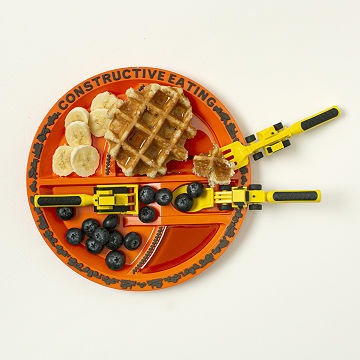 Make every meal a construction site of creativity with this plate and set of equipment-inspired utensils. Hard Hat? Check. Work boots? Check. Macaroni and cheese? Check. Lay out the blueprints of healthy eating and make every meal a construction site of creativity with this fun, award-winning plate and set of equipment-inspired utensils (sold separately). With the bulldozer pusher, forklift, and front loader spoon, your little builder will always be excited to clean his or her plate. Designed with function and play value in mind, these pieces feature textured, easy-to-grip handles and are lightweight, yet rugged. Created by a husband-and-wife team whose son loved construction so much that he asked for Cheerios to use for rubble instead of snacks. Made in the US. Dishwasher safe; plate is microwave safe. Please note: Construction Plate and Construction Utensils are sold as separate items. It gets him looking at his food in a different way. If you have a kid who loves playing with his food this is great choice. My Truck Loving 2 yo Grandson is in Construction Heaven! I love this set & believe my grandson will enjoy it for many months to come. This set is great! My 3 yr old loves to eat dinner now! We use this to motivate our son (who has pretty extreme textural aversions) to try non-preferred foods. He loves anything construction related so this set is perfect. The "bulldozer" utensil is especially motivating for him and makes the process of eating positive. My only complaint in this purchase is that it was a gift, so I had it mailed to my nephew; however it was received with no gift memo so they didn't know who it came from!